With the Democratic Party primaries over, American voters can focus on issues of political substance. For instance: How do the two leading candidates for U.S. president differ in their approach to Israel and related topics? Parallel interviews with journalist Jeffrey Goldberg of The Atlantic, who spoke in early May with Democrat Barack Obama and in late May with Republican John McCain, offer some important insights. 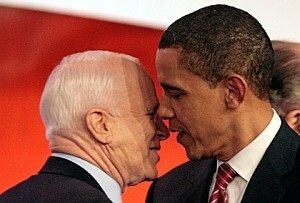 John McCain and Barack Obama, in close discussion. Asked roughly the same set of questions, they went off in opposite directions. Obama used the interview to convince readers of his pro-Israel and pro-Jewish bona fides. He thrice reiterated his support for Israel: "the idea of a secure Jewish state is a fundamentally just idea, and a necessary idea"; "the need to preserve a Jewish state that is secure is … a just idea and one that should be supported here in the United States and around the world"; and "You will not see, under my presidency, any slackening in commitment to Israel's security." Obama then detailed his support within four specifically Jewish contexts. Personal development: "when I think about the Zionist idea, I think about how my feelings about Israel were shaped as a young man—as a child, in fact. I had a camp counselor when I was in sixth grade who was Jewish-American but who had spent time in Israel." Political career: "When I started organizing, the two fellow organizers in Chicago were Jews, and I was attacked for associating with them. So I've been in the foxhole with my Jewish friends." Ideas: "I always joke that my intellectual formation was through Jewish scholars and writers, even though I didn't know it at the time. Whether it was theologians or Philip Roth who helped shape my sensibility, or some of the more popular writers like Leon Uris." Philosophy: "My staff teases me sometimes about anguishing over moral questions. I think I learned that partly from Jewish thought, that your actions have consequences and that they matter and that we have moral imperatives." In contrast, McCain felt no need to establish his Zionism nor his pro-Jewish credentials. Taking them as a given, he used his interview to raise practical policy issues, particularly the threat from Iran. For example, asked about the justness of Zionism, he replied that "it's remarkable that Zionism has been in the middle of wars and great trials and it has held fast to the ideals of democracy and social justice and human rights," then went on: "I think that the State of Israel remains under significant threat from terrorist organizations as well as the continued advocacy of the Iranians to wipe Israel off the map." Again referring to Iran, McCain committed himself "to never allowing another Holocaust." He referred to the threatened destruction of Israel as having "profound national security consequences" for the United States and he stressed that Tehran sponsors terrorist organizations intent "on the destruction of the United States of America." A second difference concerns the importance of the Arab-Israeli conflict. Obama presented it as an "open wound" and an "open sore" that infects "all of our foreign policy." In particular, he said, its lack of resolution "provides an excuse for anti-American militant jihadists to engage in inexcusable actions." Asked about Obama's statement, McCain slammed the idea that radical Islam results mainly from the Arab-Israeli confrontation: "I don't think the conflict is a sore. I think it's a national security challenge." Were the Israeli-Palestinian issue resolved tomorrow, he pointedly continued, "we would still face the enormous threat of radical Islamic extremism." Finally, the two disagree on the import of Israelis continuing to live on the West Bank. Obama placed great emphasis on the topic, commenting that if their numbers continue to grow, "we're going to be stuck in the same status quo that we've been stuck in for decades now." McCain acknowledged this as a major issue but quickly changed the topic to the Hamas campaign of shelling Sderot, the besieged Israeli town that he personally visited in March, and whose predicament he explicitly compares to the mainland United States coming under attack from one of its borders. Goldberg's twin interviews underscore two facts. First, major-party candidates for the U.S. presidency must still pay homage to warm American ties to Israel, no matter how, as in Obama's case, dramatically this may contradict their previously-held views. Second, whereas McCain is secure on the topic, Obama worries about winning the pro-Israel vote.